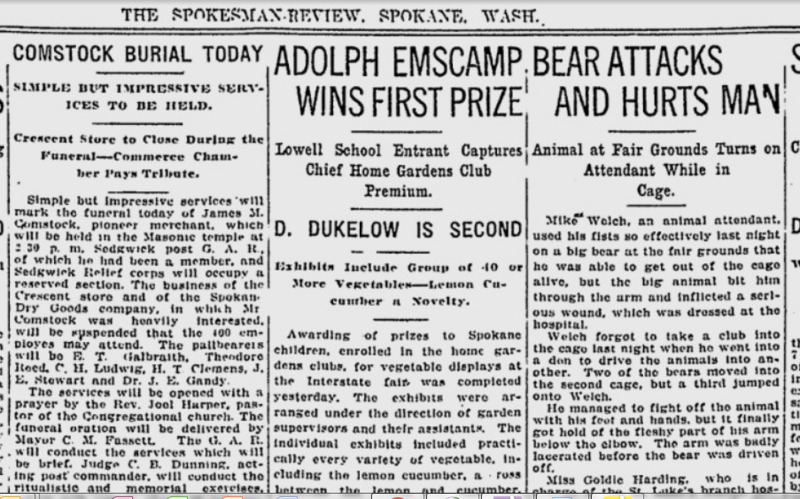 A caged bear at the Interstate Fair turned on Mike Welch, animal attendant, when Welch unwisely entered the cage without a club. Welch was trying to drive three bears from one cage into another. Two of the bears moved into the second cage, but the third turned and jumped on Welch. He tried to fight off the bear with his feet and hands. “but it finally got hold of the fleshy part of his arm below the elbow.” The bear’s teeth badly lacerated his arm before the bear was driven off. Two nurses who were at the fair treated his wounds and then he was taken to St. Luke’s. From the crime beat: Cleopus Viens, 36, the kidnapper of Catherine Pluyms, 11, faced a new and more serious charge: criminal intimacy with a child. After extensive questioning, Viens confessed “to intimacies with the child,” dating from last May. Meanwhile, the Spokane Daily Chronicle was taking credit for helping capture Viens. Mrs. M.W. Kosch of Cavendish, Idaho, near Elk River, had read the stories about the missing girl in the Chronicle. “I had seen a man and a girl with a footsore, worn-out horse hitched to a buggy, she said. “I sized it up as queer.” Then she went back and looked at the Chronicle story, and “got busy with the wires (phones).” Shortly afterwards, Viens was apprehended in Elk River.